Now we all know that while this isn't great for our blood pressure, it's FABULOUS for our tastebuds! Over the last few years SALT has really become trendy! All of a sudden salt is sprinkled on top of butter at high end restaurants, scattered across chocolates at the truffle counter and I'm being asked at my cousin's fancy Easter brunch whether I want gray salt or kosher with my meal! Salt has gone viral! Why else do you think bacon is showing up in desserts? It's not for the meat flavor... it's for the SALT! 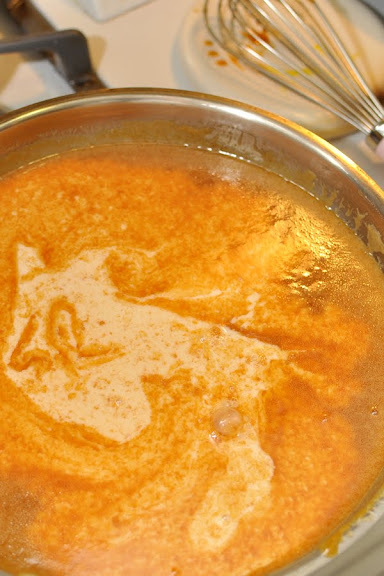 My family has a caramel recipe that is just ridiculous. And by ridiculous, I mean tremendously delicious in every sense of the definition. But there's no salt in the recipe. 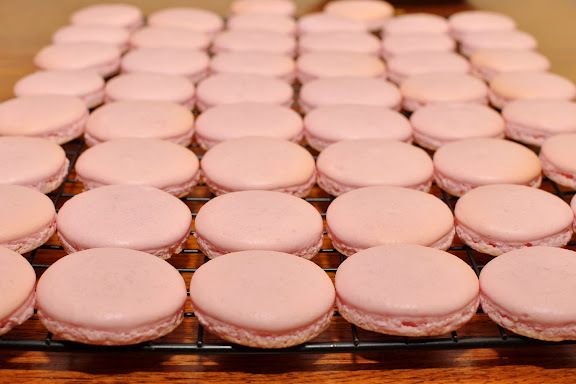 I've recently started making them and sprinkling the tops with Kosher salt as I wrap them. And now, if something that was previously ridiculous could be even more so?...it is! Sugar, butter, cream, milk, salt? Yes please. 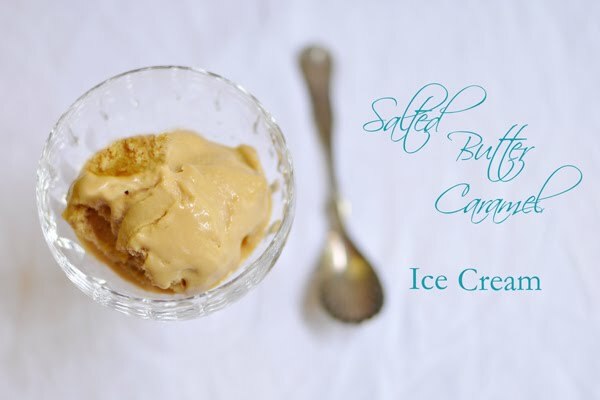 Salted Caramel is definitely the newest trendy flavor in the dessert world. 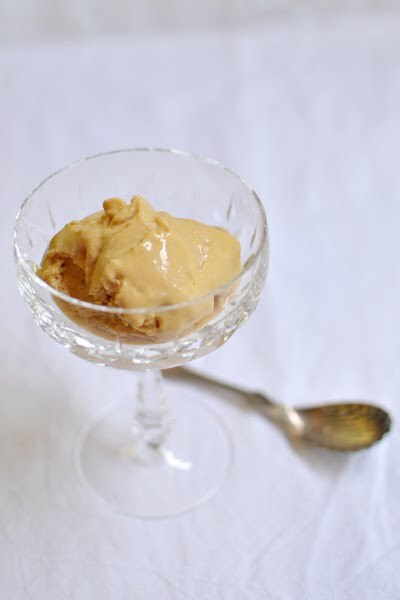 EVERYTHING is salted caramel these days. 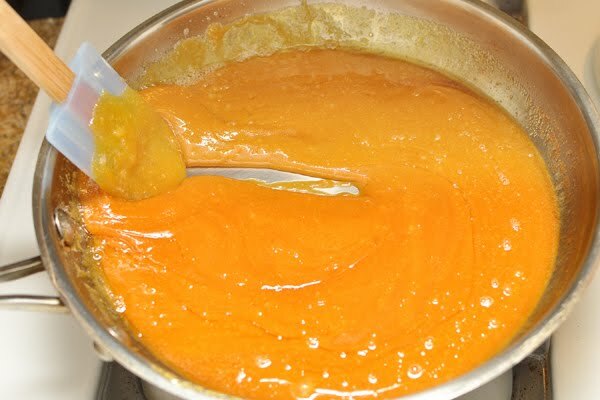 Caramel without salt? Does anyone even WANT that? I have Mr. Lebovitz's ice cream book. I scanned it and found nothing. So I did a web search. And guess what came back? Mr. Lebovitz. Again. He must be the master! I ♥ my ice cream attachment! The second, SUCCESSFUL time, I made sure to take the sugar off the very low heat before it had even all melted. WAAAAY better. And not just better. UNBELIEVABLE. I couldn't be-LIEVE how good it tasted. It was so good, it was devastating. I kid you not. Want some? SORRY! All mine! In the interest of time, I didn't put in the caramel praline, but I certainly will in a future making! The one thing I couldn't figure out - and perhaps someone out there can give me a hint? I could never get the ice cream to freeze very hard. I took the temperature of my freezer and it was a cool 0°. The ice cream froze but it was almost a soft serve by the time it was in the bowl ready to eat. Didn't affect the flavor tho. Mmmmmmm. A recent tweet? 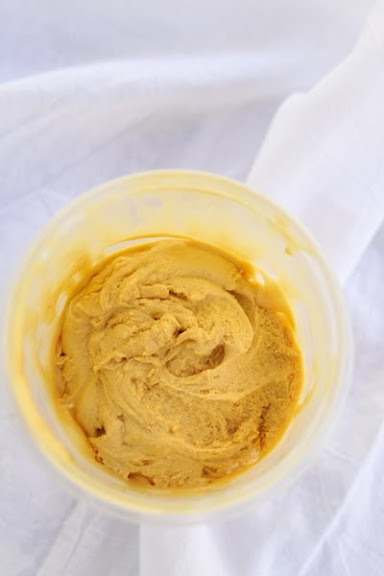 : "making salted butter caramel ice cream. And dying. And going to heaven. Cuz I just sampled a little of the custard before putting it into the machine..."
I guess it's possible I'll never actually visit Bi-Rite now. Why would I need to when I can make this magnificence at home? My mom. She's happiest in her kitchen. 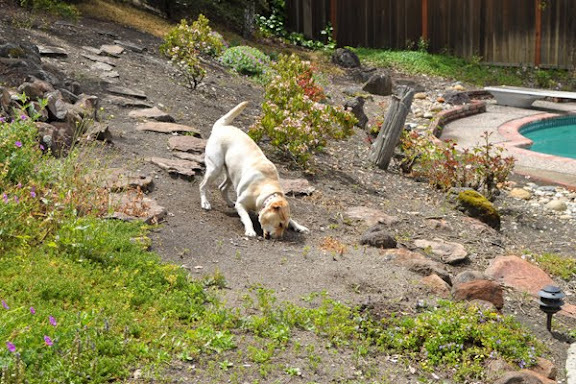 But after that she's happiest in her yard. Yes, I inherited my mom's crafting and cooking and baking and sewing (and bossiness). 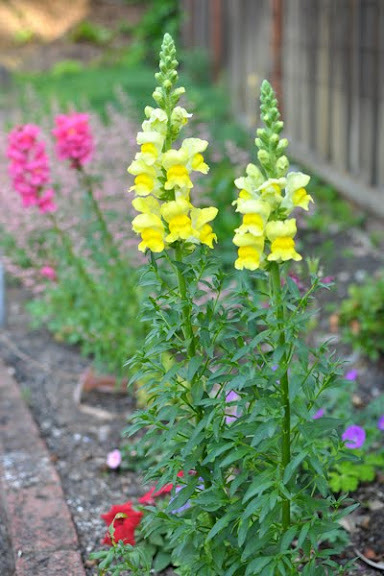 But what I didn't inherit was her gardening. My mom loves, loves, loves to putter around her one third of an acre and landscapes the entire plot herself. HERSELF. She loves it. She's truly in heaven when she's in her yard. 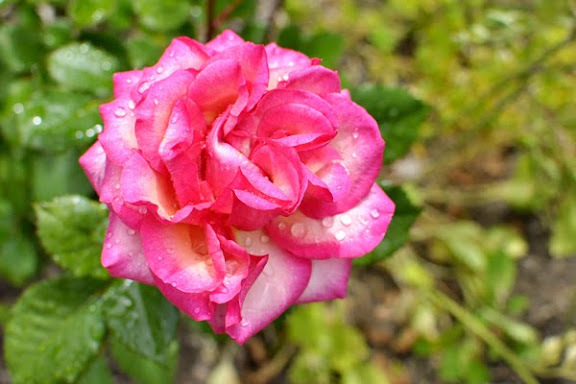 Vegetables and fruits and flowers and shrubs and trees and grasses and ground-cover and hanging plants. They're all out there. And on Mother's Day all she wants to do is be out there with them. 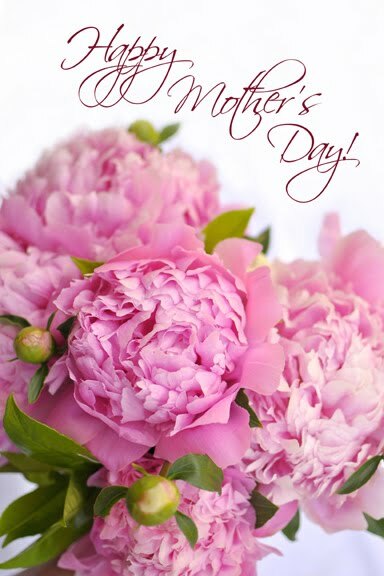 Mom and I both ADORE her gorgeous peonies. She grows TONS of these and they bloom every May. So today... Mom gardened. She also got Dutch Baby pancakes for breakfast (made by moi) and went shopping and to Starbuck's with me. And got dinner made for her (for the most part; she CAN'T stay out of her own kitchen!) And got her kitchen tidied by Dad and my brother, collectively... with some grumbling from the brother. Hrmph. Lucca helped too. Until she no longer helped. And got a time out. Naughty grandpuppy. 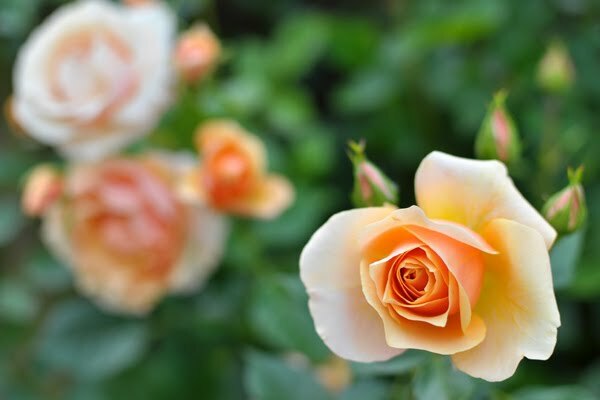 Happy Mother's Day to you and your mother and any other mother you know or used to know. Moms are the best. Cinco de Mayo was a few days ago. I don't particularly make a point to celebrate every little holiday that comes around, especially if times are busy (when are they not?) But Wednesday night, I found myself with no plans and at the last minute decided to get together with my friends John, Janelle, their dog Abby and their foster dog, Bo. I brought over Mexican takeout, a tres leches cake, margarita mix and Miss Lucca. Ok, let's not lie: the main reason we decided to get together was to let Bo roughhouse with Lucca since they'll basically play together nonstop for as long as they are within reach of each other. 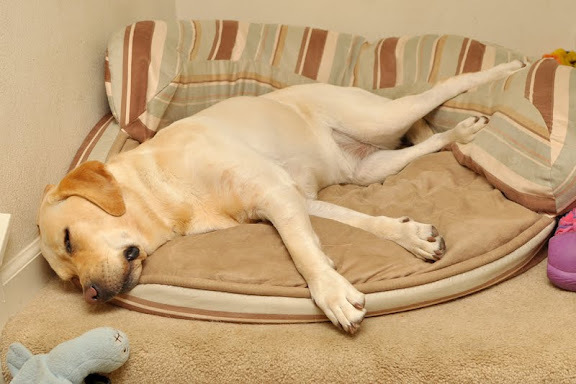 Have you heard that phrase "a tired dog is a happy dog"? But the whole Cinco de Mayo "party" was fun too. I have an incredibly difficult time showing up places without baked goods. Potlucks, dinner parties, friends' houses, my office, picnics, bike rides, birthdays, kid parties, dog parties, my parents' house, housewarming fêtes, holiday get-togethers, BBQs, meeting friends for lunch, baby showers, bridal showers, kickball games thrown by friends at a park close to my house. You get the idea. "Cinco de Mayo Hangout with John, Janelle, Abby and Bo" was no exception. 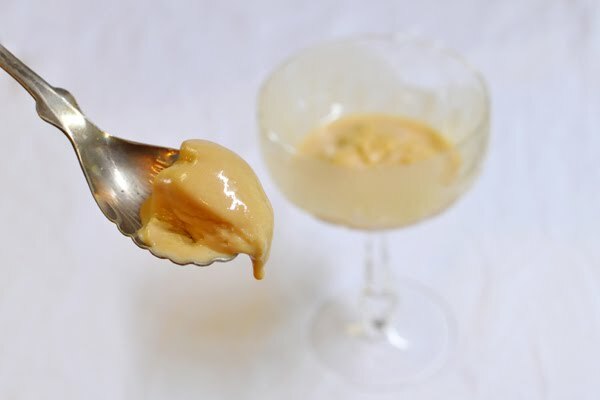 I'd thrown some Mexican dessert ideas around all afternoon. I wasn't overly excited about Mexican Wedding Cookies since I make them all the time. And flan should really sit overnight in the fridge before serving. So I suddenly remembered an "award winning" tres leches cake my old VP made for this baking contest we had at work (which I actually WON with this pie!!) Everyone loved her tres leches and fortunately for me she still had the recipe on her blog at work. Well as I always do - I reworked the recipe. I'm not entirely sure why I always do this. Maybe so that I feel like the recipe is my own? Or to challenge myself to find a "better" way to do something? So I really didn't do her recipe. 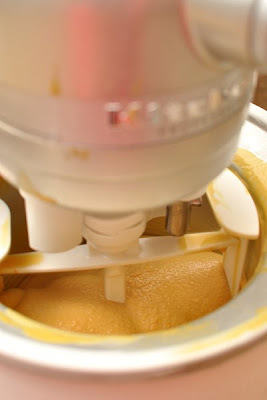 Actually, I did something similar to this and roughly used my veep's ingredient measurements. 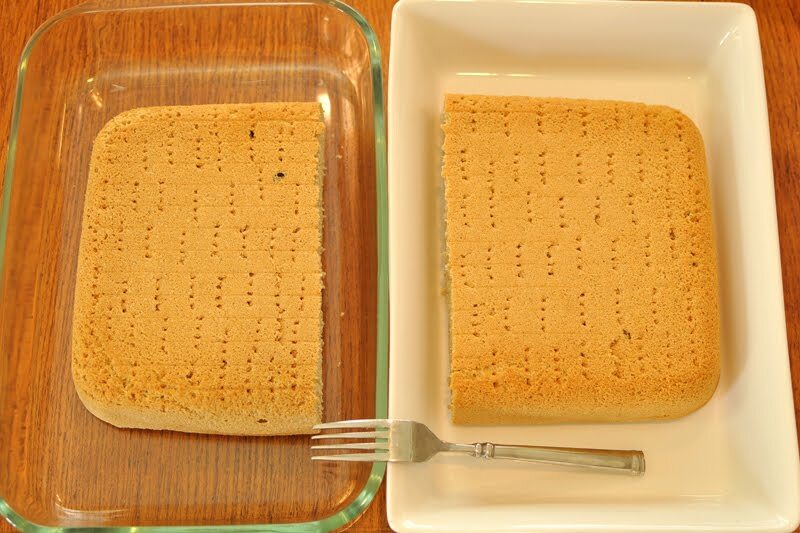 The cake is made like a sponge cake. 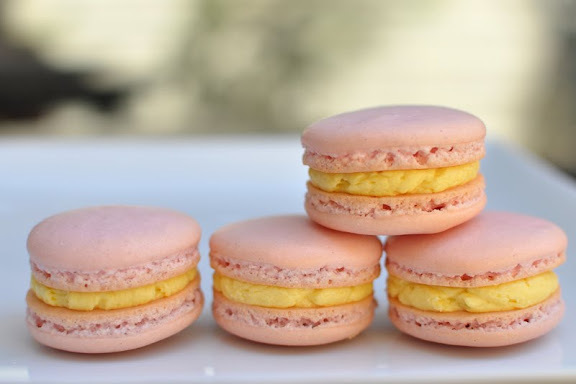 Whip egg whites to pretty stiff, beat yolks and sugar til they're ribbony, then fold it all together with some flour. 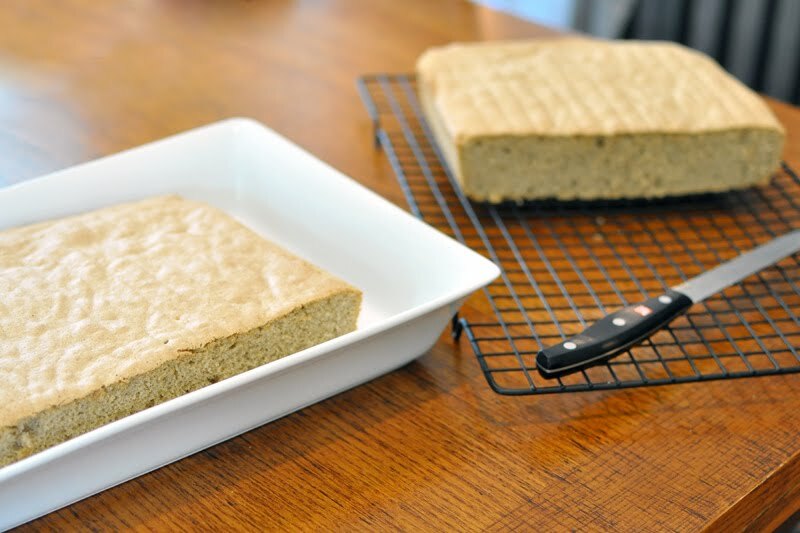 It's important that the cake be light and spongy since this is what keeps the cake from becoming too soggy and drenched with the milk. If it were too dense, it'd fall apart after a night of soaking. I wonder how that got started? After the cake bakes you soak it or drench it in a mixture of three different types of milk. 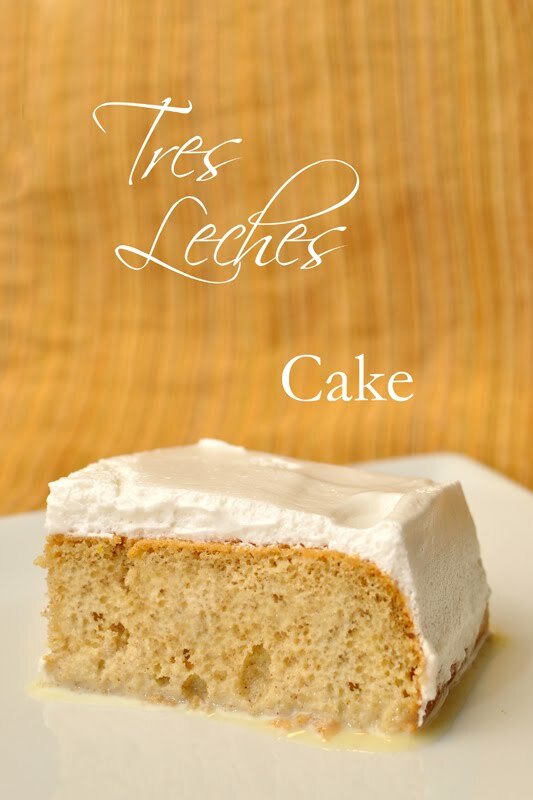 OBVIOUSLY where the name "tres leches" or "three milks" comes from. 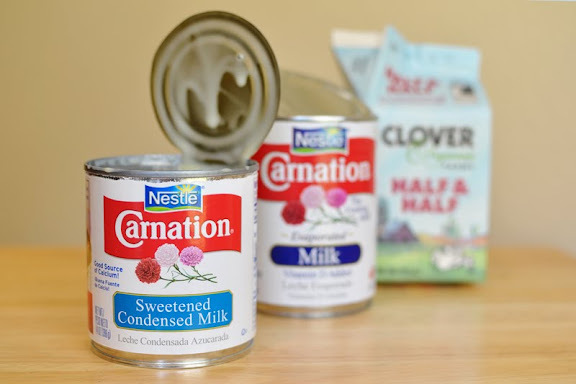 Evaporated milk, sweetened condensed milk and cream or half and half. I became stupid for an hour or so and never thought to make a half recipe for 3 people. I did #2. Initially, I was a little disappointed. 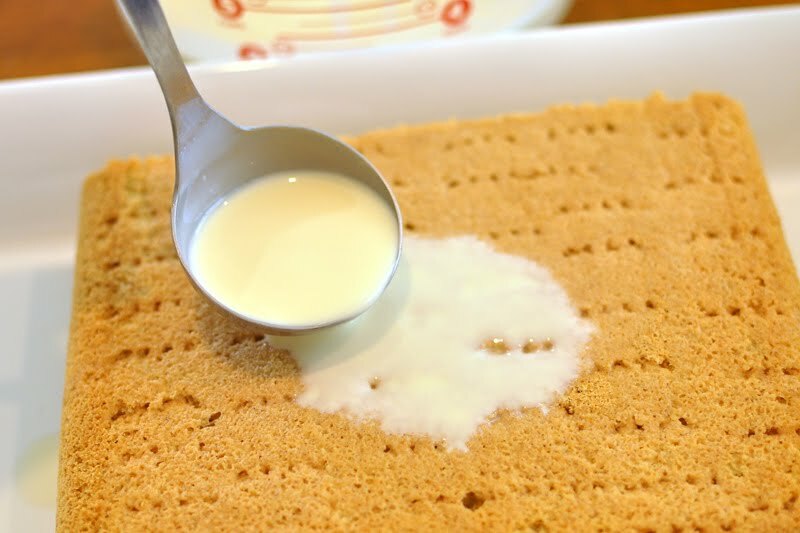 As I was assembling the cake, the milk started to pool up around the cake on the platter after it was "full". And as we ate it, it was mostly just the bottom of the cake that was still moist and wet. The top half of the cake had "drained" if you know what I mean. This part was fun! Whee!! However, by the next day it seemed to be about perfect. Not too soggy and not too dry. And I guess, if I'd done #1 and let the cake sit in the milk for too long (like overnight or a day) it'd get soggy and fall apart - so really, it's a balance. In the end I think I did prefer how I made it - sort of "half soaked". 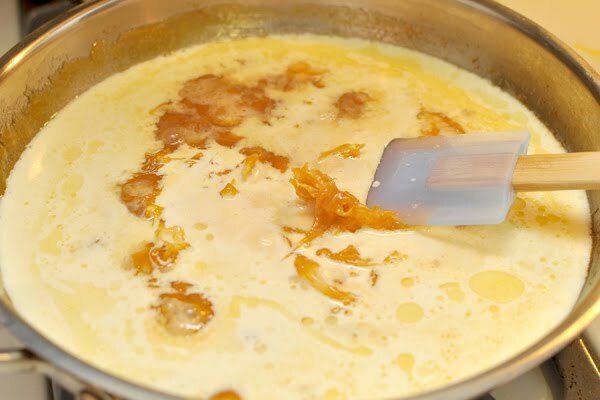 Then, if desired, one can just spoon some of the extra milk on it. I just wrote about 3 paragraphs on how to pour milk onto a cake. I hope someone gets something out of that. I've read of a couple different toppings for tres leches cake. 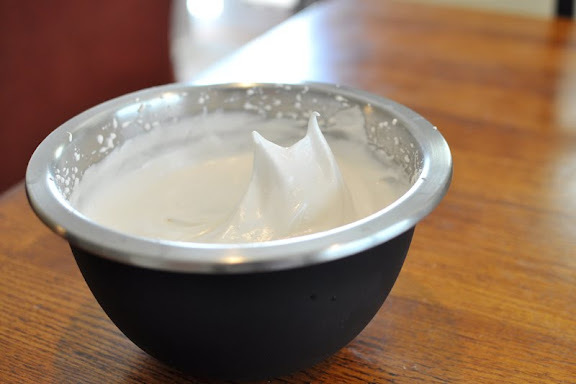 Sweetened whipping cream, or an Italian meringue. Wait, did I just write Italian meringue?... 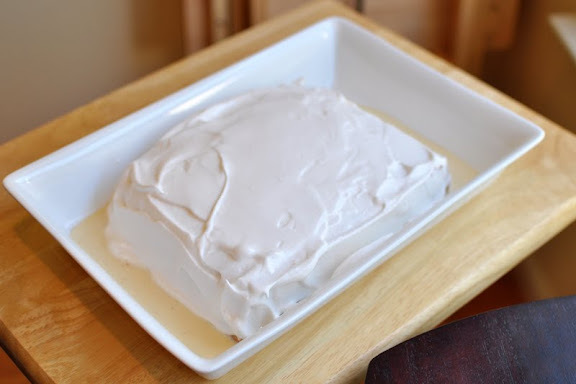 to top a Mexican tres leches cake? 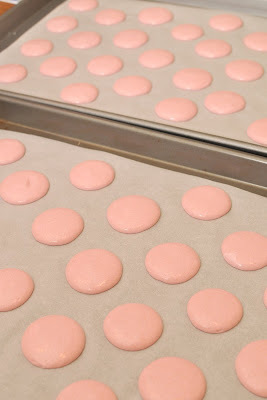 But yes, I did, since when one cooks a sugar syrup then pours it into egg whites and beats it to a frenzy --> I (and most bakers) would call this "Italian Meringue" (vs. French which is baked if not left raw and Swiss which is cooked). Definitely serve this on a plate with sides! 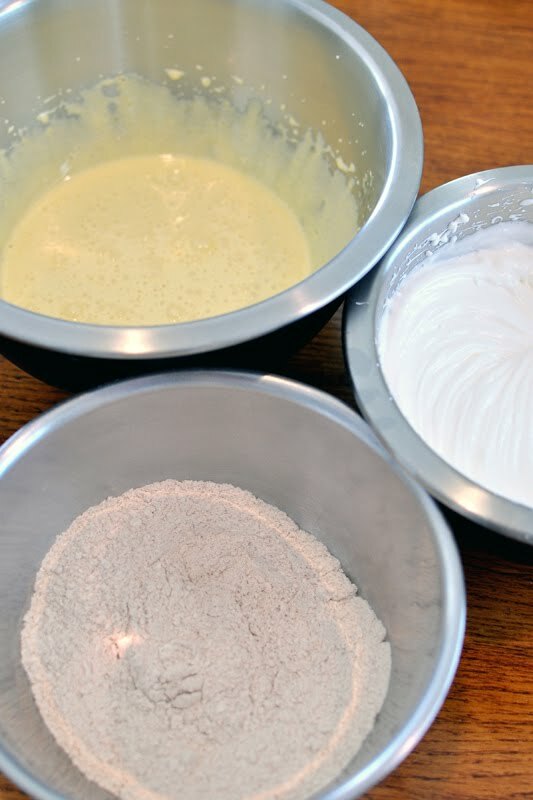 This recipe had me making the meringue topping. 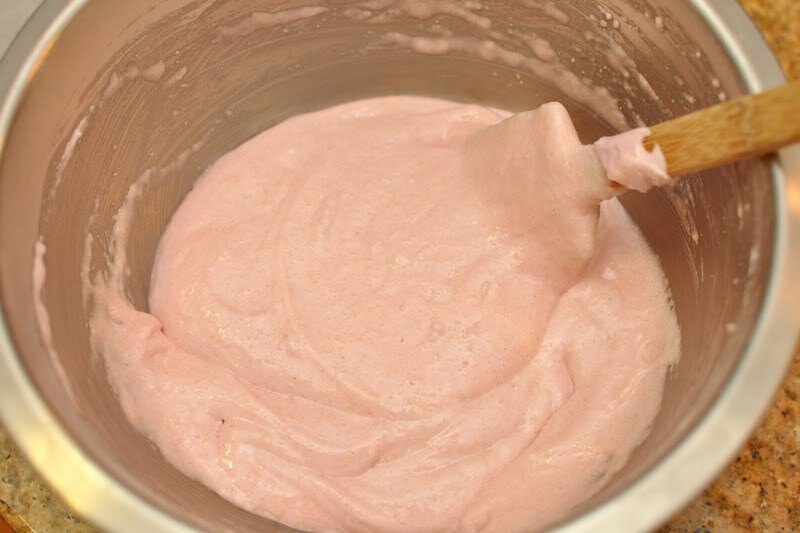 It's a nice and airy "frosting" that isn't overly sweet nor overly fatty. 'Twas yummy! It's a cake that could be described as refreshing. I really liked the addition of the cinnamon to the cake. I had a coworker ask if it was wheat flour. Ha, I wish! I've been making a lot of macarons lately. Something I hadn't really done much of since the craziness that was 2 years ago... But as your average foodie knows, they've become something of a mainstream delicacy. 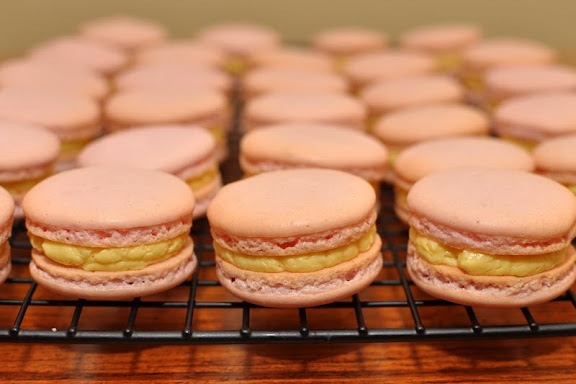 I predicted this would happen, 2 years ago when I swear Helen single-handedly seduced the entire food-blogging world into making French macarons out of their home kitchens. 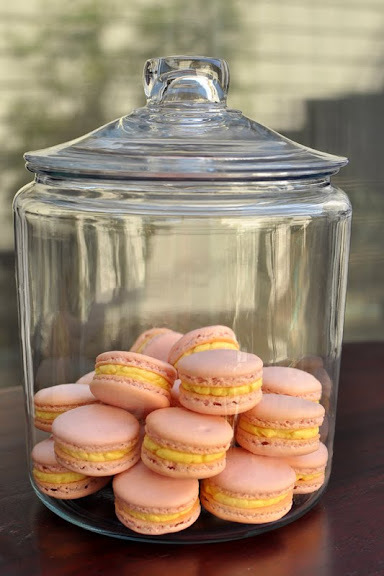 And look what's happened - they have totally become the "new cupcake". The only problem is that they are nowhere near as simple to make as cupcakes! After making probably 50-100 batches of macarons over the last couple years I think I've ACTUALLY and FINALLY gotten to the point where I can produce a pretty consistent product. It used to be so hit or miss. One batch would be gorgeous while the next would be a disaster. And I had no idea what I'd done. Or if perhaps I'd done nothing wrong and it was...the oven... or, the weather... or, the egg whites... It was infuriating! I've said it before and I'll say it again - macarons are just about the most difficult item I've ever turned out of my kitchen. It's one of those things that's all about feel and experience, so teaching oneself to make them can be a very frustrating process. It'd be a whole lot better if one could be shown. But I didn't have a teacher. So I taught myself from books and websites. That's probably why it took me a gazillion tries to really GET IT. 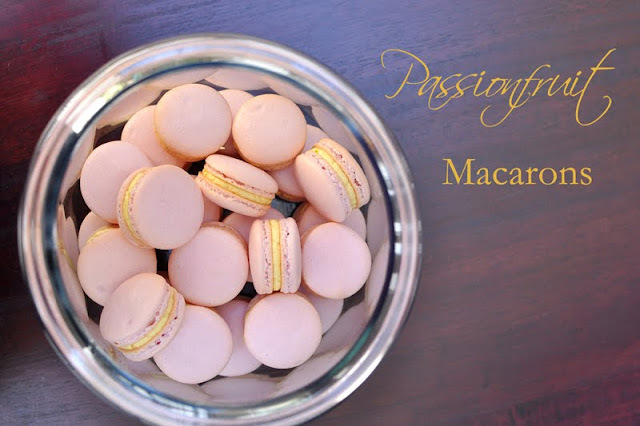 I have to just mention here that I would not have been making passionfruit French macarons this weekend had I not tasted Anita's friend, Ray's passionfruit macarons at our bake sale a couple weeks ago. 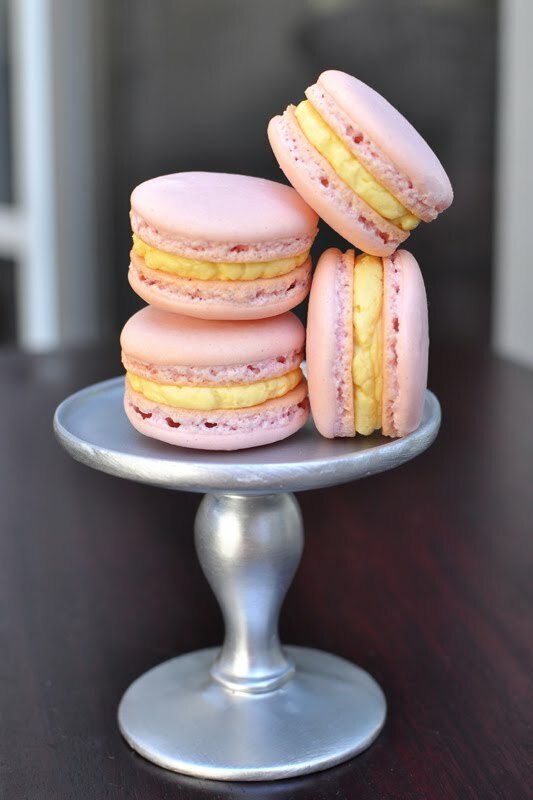 Ray brought some passionfruit macarons that day and as soon as I tasted that buttercream (the flavor is all in the filling - the cookie is just 'yer average unflavored mac) I HAD to make my own! 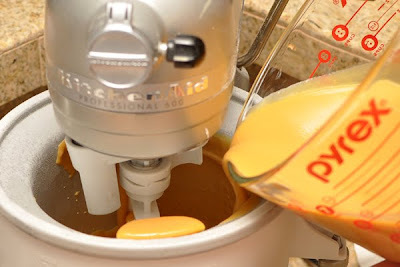 Fortunately for me/us, Ray is a sharing type of guy and told Anita the ratio of buttercream to passionfruit puree he used in his filling: roughly 1.25 to 1! Hot diggity dog! 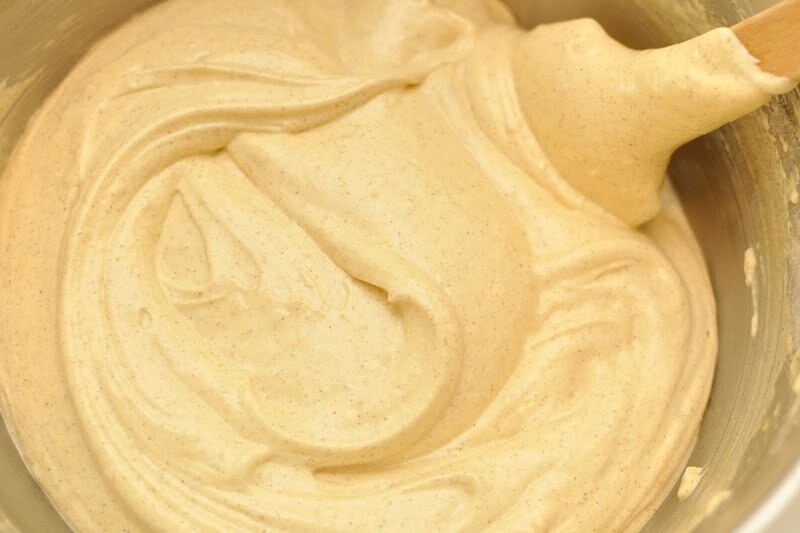 I got my grubby paws on some (excruciatingly expensive) passionfruit puree, whipped up some swiss buttercream and... was in heaven. 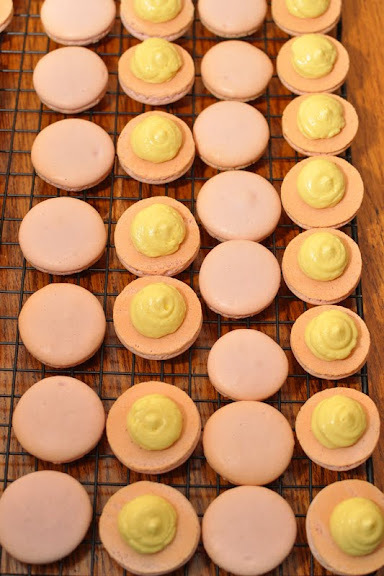 I don't think I've ever actually put my macaron recipe on the blog before and that's mostly because I didn't feel "solid" enough about it to share it. But I'll share this one since it's the one I use most of the time and it's quite SOLID by this point. 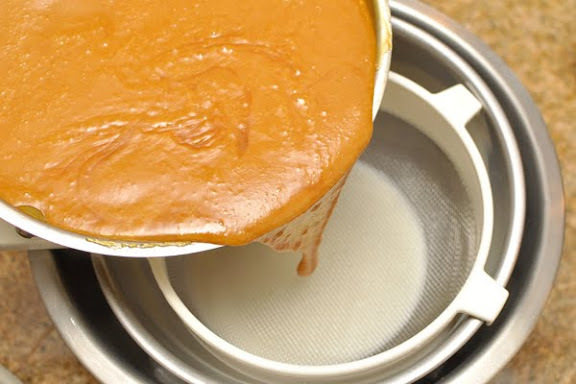 Sieve the ground almonds once or twice to make sure there are no big pieces (always measure after sieving, obviously!) Add the powdered sugar. I was recently asked why I use aged egg whites and if fresh would be okay: allowing the egg whites to age is actually allowing moisture to evaporate from them (this is why you leave them uncovered). 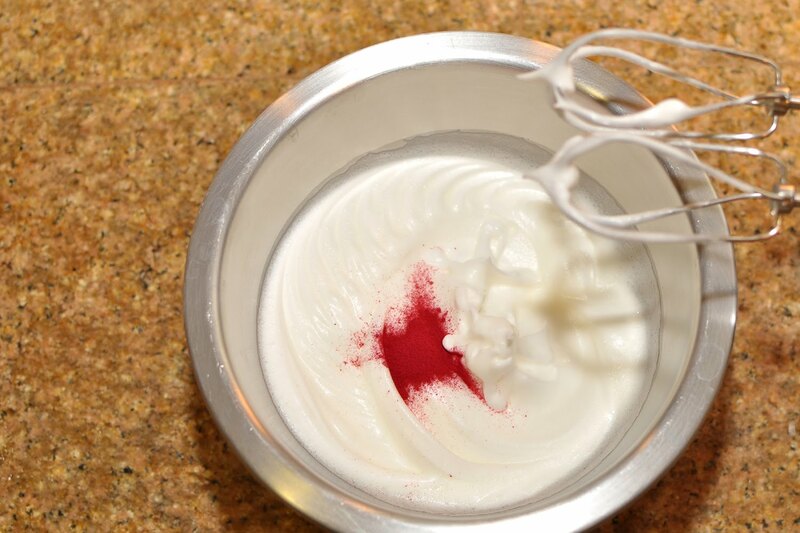 The less moisture in the egg whites - the more stable they will whip up. If you are uncomfortable letting them sit at room temp (or want immediate gratification) I've done Helen's suggestion of zapping fresh/cold egg whites in the microwave for about 5-10 seconds - just until you start to see strings of white - and this seems okay as well. 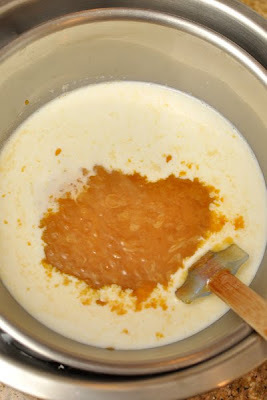 Add the whites to the almond/powdered sugar mixture and FOLD gently but sufficiently until the batter flows SLOWLY. You don't want it to be runny, nor do you want it to hold its shape. It's incredibly particular. If you don't fold the batter enough you will get meringue cookies. 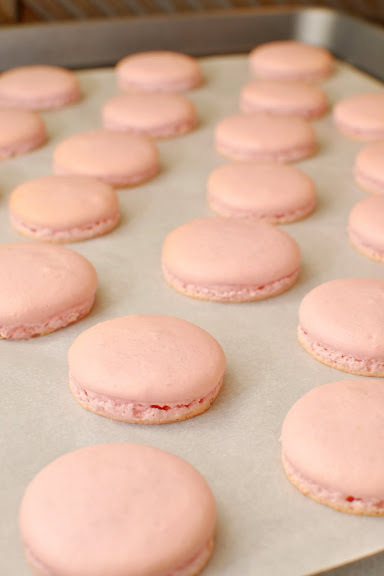 If you fold it too much your macarons will not develop the "foot" they require to truly be called a macaron; or worse they will crack and break and essentially FLOP. Sometimes this can be a matter of 1-2 strokes difference! 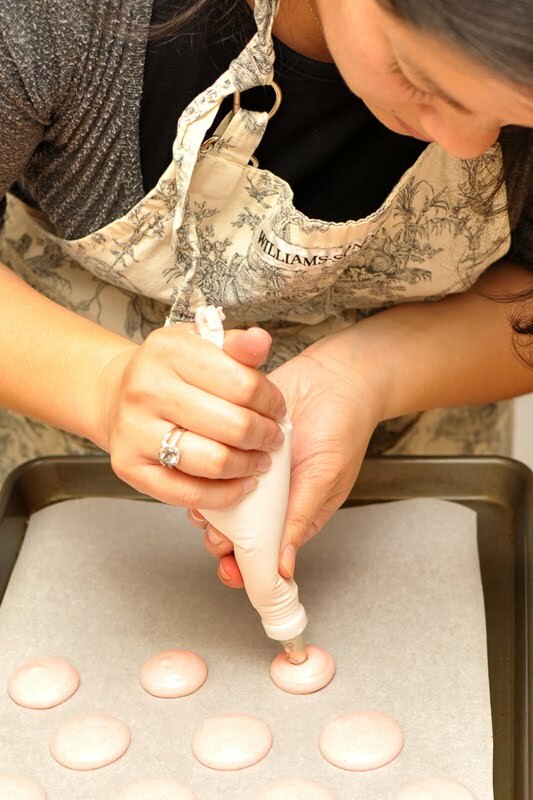 Pipe rounds of cookie batter onto your parchment/Silpat at least 2-3" apart. 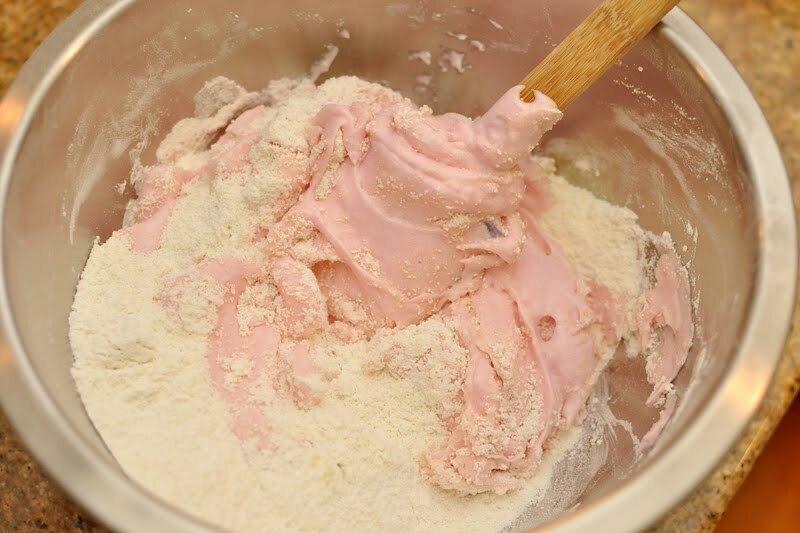 If your batter is a tad bit under-worked, you might get a little tip that doesn't spread into each cookie. Just press it down with a slightly damp finger. Now let the cookies hang out in a dry environment (humidity? rainy day? I'm not sure what to tell you...) for at least 45-60 minutes. I've always erred on the side of 60 minutes, but I know others who pop them in the oven after 30. To each their own. However long it takes for your macs to develop a reasonably thick "skin" on top. After you take them out, let them cool COMPLETELY. Don't attempt to peel them off the parchment paper/Silpat before they cool or they will become 2 pieces of cookie, instead of 1. Pipe your buttercream of choice onto 1 cookie and smoosh with the other. I like to let them rest in the fridge overnight, before reintroducing them to room temperature for about 10-15 minutes and gobbling them down. These particular macs I filled with the passionfruit swiss meringue buttercream which was devastatingly delectable. I made a ginormous amount of the buttercream so I have no idea how much one would need for this recipe. But what I can tell you is that if you mix 1 part passionfruit puree with 1.25 parts buttercream - you too can die and go to heaven! !